As great and utterly amazing the results are of objects made by 3D-printing, they are not always produced out of sheer perfection every time out. The use of additive layering to produce things definitely requires some post 3D printing work to bring about the best results. It may include sticking several parts together, curing, or even repairing a few broken pieces. The post 3D printing work may sound easy and effortless, but anyone who knows additive manufacturing will know that is sometimes the most taxing and demanding part of the job. People who dabble in 3D printing, particularly those who are just new to the experience often surmise that the best works can be wrecked by simple defects that sometimes take such a huge amount of effort and time to address. This is also especially noticed when the 3D-printed work requires the use of supports. The ability to quickly and effortlessly smooth out details or to hold different parts together is something all 3D printing enthusiasts would love to have. It is something that Fixer3D offers to the 3D printing community. The current technique used by most people involves the standard syringe containing liquid resin. By shooting liquid resin to a surface, the user can glue together things or cure a certain spot. The liquid resin is also allowed to dry using UV light. There are definitely a few things that need to be worked out to perfect this technique. First on the list is the control one has over the syringe. Presently, the ability to use just the right amount of liquid resin has been an exercise in patience and fortitude. Because of lack of control when injecting the fluid, the 3D-printed object may end up worse that it originally was. 3DFacture comes into the picture to solve this with the Fixer3D. As the name suggests, it serves to do basically everything that needs post 3D printing adjustments. Plus, it promises to do so in an easy, efficient, and stress-free manner. The Fixer3D has a programmed mechanism that runs using a micro step motor. This provides the user with utmost control of the syringe at all times. Whether one needs just a tiny drop or a flow of liquid resin, the device will work just as required by the user. The clincher is the ability to mop things up in case the user injects too much liquid resin. With the same device, one can easily extract the extra resin. The cherry on the top is the LED UV light that works to dry the results. 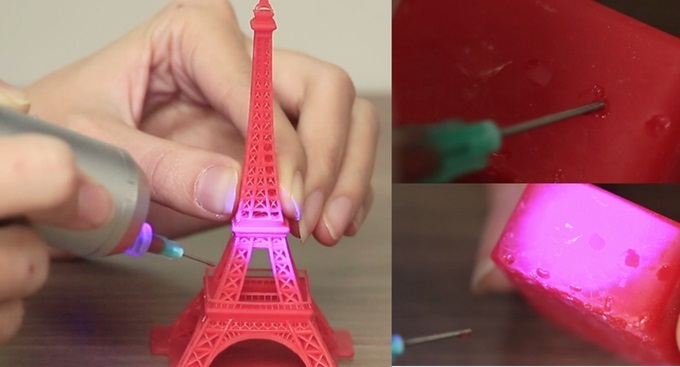 If that is not enough to send people running to 3DFacture, the fact that it works as an adhesive material both for 3D-printed and traditional things will certainly cause the 3D printing community to make a beeline towards 3DFacture. Because the use of supports is very common in additive layering, the Fixer3D will naturally be a great asset in various ways. People who use electronics to make things run will find the device wonderful as well. Fixer3D is also an open-source design regarding the firmware, which means that users can customize it to fit their specific requirements. You can support them on Kickstarter.